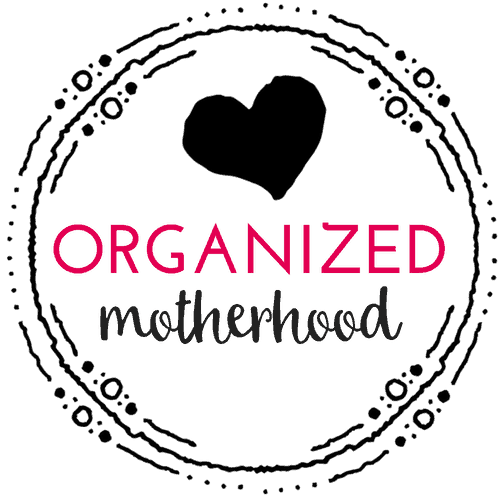 I am so excited to welcome Rachel from Smart Mom Smart Ideas to Organized Motherhood today! I love her tips as a fellow time-challenged mom who’s sharing solid tops to get organized! Scatterbrained, forgetful, late, disorganized. Has anyone ever described you with these words or phrases? Maybe you describe yourself with these words (I’ve described myself as scatterbrained, forgetful and disorganized in the past). 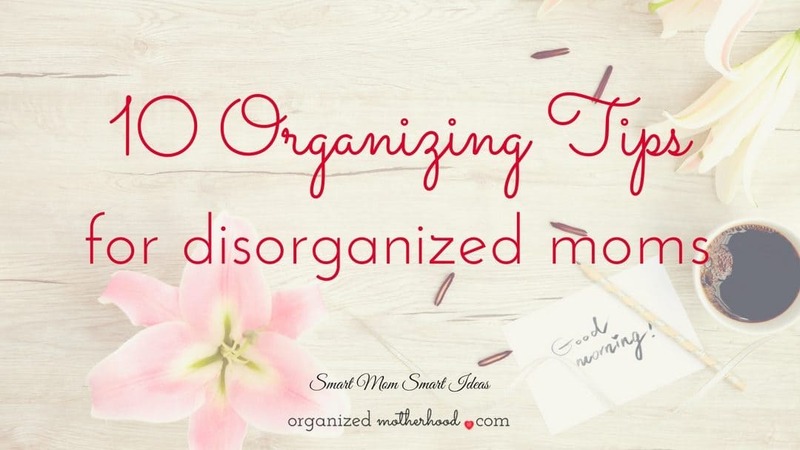 How can a disorganized mom be more organized? 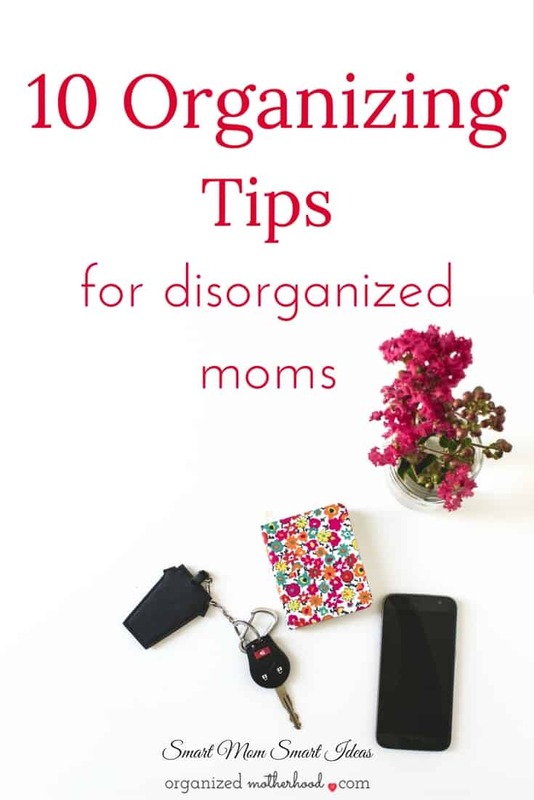 Here are 10 organizing tips to help disorganized moms. Organization skills are not always skills that happen instantly. You probably won’t go to bed one night a disorganized mom and wake up the queen of organization tomorrow. But we can add simple steps into our day to make us more organized. When my kids were babies, I constantly lost my car keys. I really can’t remember what I would do with them. I guess when you are carrying a baby, diaper bag, purse, and more… the keys just fall wherever. Since I was also chronically late during this time in my life, losing my car keys was big stress for me. I finally learned to keep my keys in one place – every time. I use a simple metal D-ring clip and hook my keys right on my purse strap. No more lost keys. If you don’t want to attach your keys to your purse, you could have a hook or organizing center in your home and always place your keys in the same place every time you come home. Remember, the system will work if you consistently follow it always keep your car keys in the same place every day. This change alone reduced so much of my stress. I can honestly say I have never been a morning person. I would set my alarm clock for 6:30 (or early enough that I could hit the snooze button 2 or 3 times before getting up). But waiting until the last minute to get up will also cause you stress and leave you disorganized. Plan to get up 15-30 minutes before your kids. Allow yourself a few minutes to relax before the busy morning starts. 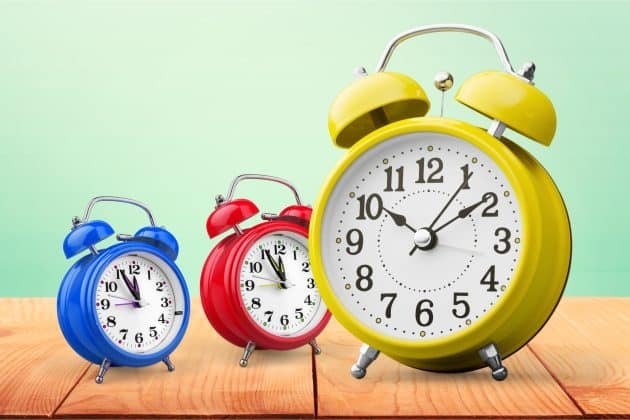 Take 5-10 minutes to plan the morning, remember anything that needs to be completed (like add the PE clothes in the dryer to the gym bag before school). This is also a great time to start your morning routine getting dressed, taking a shower so you are a step or two ahead of the kids. Part of the reason busy moms feel disorganized is that we don’t have a plan. We get up, start getting ready, get the kids out of bed, take them to school, but don’t have a clear plan for the day. If we don’t have a clear plan for what we want to accomplish each day, we don’t get anything done and are we completely disorganized. Start tonight making a simple plan for your day tomorrow. The plan can include basic things like making appointments, grocery shopping, and going to school activities. Be clear how you can make your day organized and successful. At the very start of your day, set your priorities and must do list. Do you need to set a doctor’s appointment for your daughter or schedule a meeting at work? Set a plan for your must do items every morning. When you get to midday or lunch time, you should have most of the daily priorities and must do items completed. If not, set a plan to get them done quickly. You will be surprised how much better you feel in the evening or before you go to bed when you know you completed your priorities today. 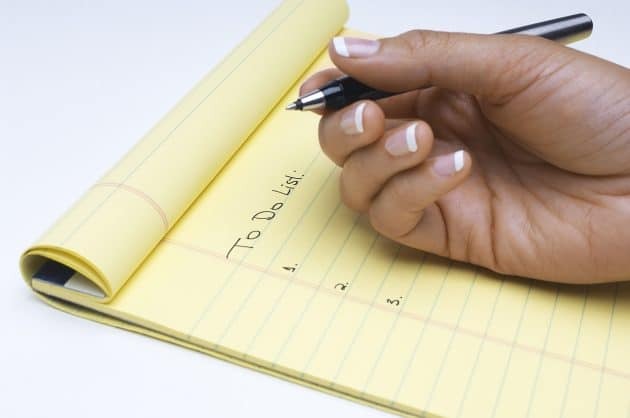 Here are a few more ideas to complete your priority task list every day. 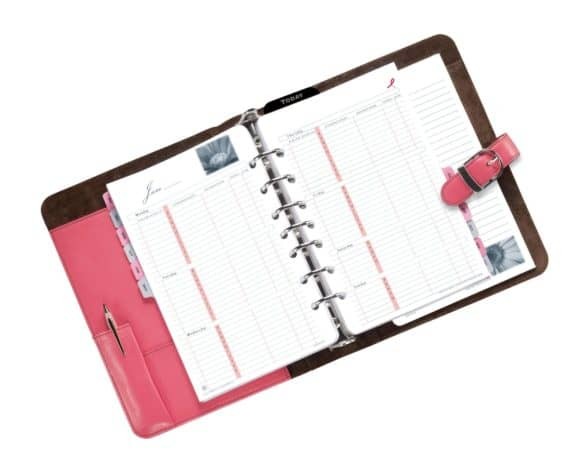 To keep your day organized, keeping your master family planner with you at all times is a must. When you have your planner with you all the time, you will be able to organize your day and stay organized. If you are scheduling an appointment for next month, you need your planner to know your schedule so you don’t double book your day. How many times have you forgotten appointment or meeting because you didn’t have your planner with you? Don’t let this happen to you. Keep your planner with you every day. Review it at least once every morning for an overview of your day. Lost shoes drive me crazy! My kids have a bad habit of leaving their shoes everywhere – in the car, in the living room, in 2 different places. To stop the lost shoe crisis, everyone has a place for their shoes. I am working hard to teach my kids to put their shoes in the same place every time. If you have a set place for everything in your home, you are less likely to lose things because you will always know where to look to find things. Of course, you have to put things away every day for this to work. But a few minutes of clean-up every day saves lots of time looking for lost items later. I love routines. I have routines for everything. I have routines for the morning. I have routines for the evening. Routines keep me organized and help me know what I have to do right now. Routines help me to know what needs to be done each morning and each evening and keep things running smoothly at home. What routines do you need? Maybe you need an evening routine? Or a routine to make your morning better? Take a few minutes and create few routines that will work for you. Have you ever been at the grocery store or out shopping and remember you need to pick up something, but you can’t remember what you need? Then, soon as you get home you remember it. One simple way to stay organized is to keep your shopping list with you or on your phone. It will be much easier to remember what you need and save you time because you won’t need to make a second trip to the store. I don’t know about you, but it seems like my purse collects everything. Receipts, lost change, papers, candy, kid stuff, you name it, it’s probably lost in the bottom of my purse. I like to keep my purse organized by taking 5-10 minutes once a week and cleaning out all the junk that has been added to my purse for the last week. By taking just a few minutes to remove the clutter from your purse, your purse will be more organized and you will find what you need faster. I am chronically late! I have to fight my “late” gene. One of the best ways to stop being late is always leave 15 minutes early. I don’t always succeed at leaving 15 minutes early (many days I fail, remember that late gene), but at least I don’t leave 15 minutes late and make everything worse! Planning to leave 15 minutes early is a life saver. Now you have 10 actionable tips that will help you be more organized. Let’s get started. What will you do to be more organized? What more organizing tips? 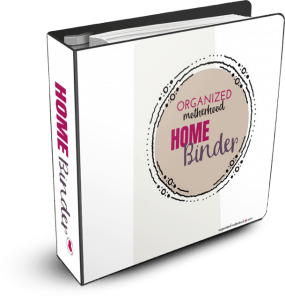 Get 50 Organizing Tips for Busy Moms Cheat Sheet. 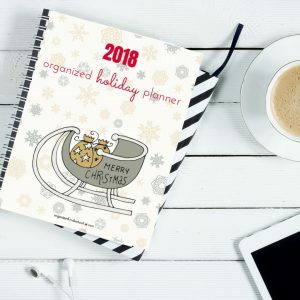 Rachel Newcomb blogs at Smart Mom Smart Ideas where she writes about home organization, time management, parenting, motherhood, and work/life balance. You will find many articles to help you have an organized home, balanced family and focused life. She invites you to access the Smart Mom Resource library which includes free printable meal planners, goal setting worksheets, an inspiring coloring book and more.